Location: Elbert, Co. Colorado between Simla and Cedar Point. Summary: Departed Denver at around 1430 local with original target area up near the CO/NE/WY border area. 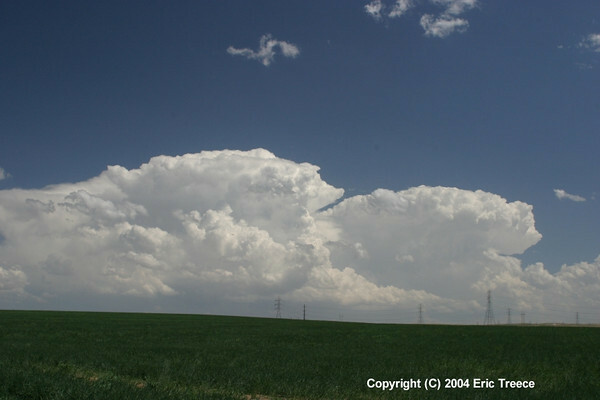 As I pulled out of town I noticed some really nice updrafts going up near Kiowa, CO. I decided to go to Byers, CO and top off the gas tank and hang out for a while. I watched the first two storms die. I noticed towers beginning to go up all along the Front Range and began to think maybe I should head back north to where the ETA models had shown better shear and CAPE. Dew points were in the low to mid 50′s all along the front range. I stayed a little longer when I noticed on the radar that the 3rd cell in Elbert County was starting to show signs of wind shear on the WxWorx program I use. I gave it a couple of minutes and it kept intensifying, so I made the commitment to head south, basing my decision on the fact that a), it was really the only player in town at the time and b) it appeared that nothing was forming on the flank. I had finally found a “Tail End Charlie” storm!! I got to the exit for CO Hwy 86 and parked for about 20 minutes. After about 20 minutes the storms inflow started to improve and she started to develop rain bands on the leaded edge. I then headed west on Hwy 86 and went to Matheson and headed south on the county road out of there for a couple of miles and watched the storm develop further. When she started to wrap up I went back to 86 and headed west a few more miles to the county road just north of Simla, CO and went down it about 2 miles and set up shop. The Mesocyclone emerged out of the bad contrast and I new I had made the right choice. The wall cloud became more and more noticeable and so did the rotation within it. Soon after finger funnels would occasionally emerge and then dissipate. Finally after about 15 or 20 minutes of anxious anticipation a tornado touched down briefly. The storm did this numerous times. There was excellent rotation as a persistent rain band kept wrapping itself around the main area of circulation. A second Meso forms about 1 mile to the west of me as the first tornado was still going strong. I had to retreat to the south just a touch for a few moments should it go “right mover” on me. After I was sure I was safe I headed back north in cautious pursuit. The wall cloud was a mile or two to my NW. All of a sudden here came the Rear Flank Downdraft and some power lines broke and fell to my left creating a huge arc of electricity and sparks into the air. The 2nd tornado was rain wrapped, but I could see a few trees that I estimate to be 20-30 feet tall literally ripped right out of the ground and sucked into the air. The main area of circulation seemed to be about 1 mile to my NNW. A few seconds later the tornado revealed itself out of the rain. A new Meso was forming to my NE, so I headed East on Hwy 86. I drove about 5 miles and looked back to a gorgeous sun backed view of tornado #2 roping out and the new Meso forming to my NW now. There was a report of a tornado to my NW, but I could not confirm it. If there was it was brief. I did see numerous funnels form and dissipate out of the wall cloud, so I would tend to believe that there was one. Shortly after another Meso formed as I was at the intersection of I-70 and Hwy 86. Shortly after I got onto I-70 northbound a tornado touched down in the open prairie. It lasted about 3-5 minutes I estimate. As I approached the Cedar Pt exit another Meso formed and produced a rather unorganized wall cloud. I was having my doubts and within minutes it quickly got it’s act together and tightened up. Soon after a large bowl shaped funnel began to lower itself out of the base. Within seconds my 4th tornado touched down and quickly formed a very large cone shaped funnel. This tornado lasted for approximately 20 minutes or more and changed shape numerous times. After she dissipated one final Meso formed East of my location and put down one final confirmed tornado for the evening. I believe I captured 5 out of 6 tornadoes. After the 5th tornado I got dissipated, I headed back south to Limon, topped off my fuel tank and headed north on HWY 71 towards Last Chance. Storms had started to fire to the south and east and were marching there way north. It got really cold and it looked as though the storm was finally going to succumb to an over abundance of cold air inflow and being choked by the storms forming to the south and east. Another impressive storm could be seen to the NE near Akron as it was illuminated by lightning, but was too far away I felt before I could get to it before the southerly storms would soon choke it as well. This was without a doubt the best chase I had ever witnessed. The first towers going up near Kiowa as seen from Aurora.